A dental implant is the only tooth replacement option that restores the full function of your mouth with a permanent crown and root. It has become a popular tooth loss solution for improving the function and stability of your mouth. Whether you’re missing one or more teeth, or feel unsatisfied with your current tooth loss solution due to a slipping denture or weak bridgework, our dental services in Edmonton can provide a way to help you regain your smile. Chronic illnesses such as diabetes and leukaemia may inhibit the patient’s ability to heal after surgery. Patients who have received treatments that contain bisphosphonates—like chemotherapy drugs—need to be well scrutinized. Patients who have used popular bone-building drugs, such as Boniva and Fosamax, may need additional tests to ensure they’re suitable for implants. Patients who use tobacco products are also at risk of complications due to their diminished oral health, and may need counselling before the procedure. Besides reviewing your medical history, your oral surgeon will also assess your dental history to determine the thickness of your jawbone, the number of implants needed to restore your smile, and your oral hygiene regimen. Proper brushing and flossing is important for successful implant placement and longevity. Poor oral hygiene can cause the implant to get infected and fail prematurely. To prevent this, your dental hygienist will instruct you on the best care for your new teeth. If you want to improve your smile with dental implants, you should first find a qualified and experienced specialist to review your medical and dental history and perform diagnostic tests to determine your readiness for the procedure. Several tests may be required depending on the location of the replacement tooth (upper or lower jaw), how long it has been out, and the number of teeth that need replacing. These tests may include extractions of failing teeth, full mouth x-rays and CT (computer tomography) scans, sinus lifts or bone grafts, and temporary teeth replacements. First, a titanium post is surgically placed in your jaw to provide an anchor that will hold the crown firmly. Titanium is safe to your body. It fuses with the jaw bone through a process known as osseointegration that takes between three and six months. In most cases, your dental surgeon will require you to wait for total bone and implant integration before proceeding with the procedure. But if the healing process takes much longer, the surgeon may provide a temporary restoration to help you function. When the surgery site has healed, an abutment (connector) is placed on the titanium post through a minimally invasive procedure. The abutment attaches the replacement tooth (crown) to the implant. The final step involves the placement of the prosthetic on the anchor via the abutment, which forms your permanent tooth replacement. Although dental implants are an expensive tooth replacement option, many people ultimately choose them when they’re no longer willing to put up with the frustration and embarrassment of sliding dentures, partials, or falling teeth. Increased happiness and the feeling of wholeness. Ability to enjoy their food again. The appeal of dental implants over other tooth replacement options like bridges and dentures is that they replace the roots as well. 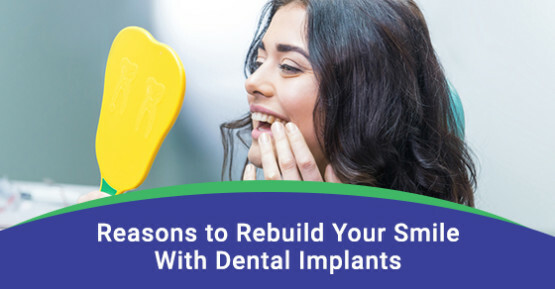 The implant is connected to the bone underneath the gums, which leads to strength and stability of the new tooth, as well as bone stimulation to help maintain the proper structure of your face to avoid an aged, unnatural appearance. Eating what you want is one of the pleasures of life that can be easily taken away by damaged or missing teeth. During mealtimes, you can enjoy this pleasure in the company of your family, friends, or colleagues. Unfortunately, damaged teeth or poor teeth replacements can lead to embarrassment in social situations, and maybe the cause for social isolation. They can also decrease the flavour of food and make it impossible to eat some of your favourite foods. Implants allow you to function like you normally do with your natural teeth, including brushing and flossing. This can help to reduce the risk of periodontal disease that is often a major threat for other teeth replacement options due to spaces between the teeth and gums that are hard to reach with a toothbrush. Implants also stimulate the jawbone like natural tooth roots, which helps to stop bone loss and shifting of the remaining teeth. Ultimately, this helps to reduce the risk for jaw pain and popping, TMJ disorder, headaches, and migraines. The strength of implants also allows you to maintain a proper diet, which is necessary for good health. In addition, many patients claim to enjoy more restful sleep once they replace dentures with implants. Teeth help to support the structure of your face. Missing teeth and tooth replacement options that don’t stimulate the underlying bone tissue cause the body to resorb (dissolve) the remaining hard tissue. This in turn causes your teeth to shift and the structure of your face to change, making you to appear years or even decades older. Bone loss can cause wrinkles to deepen, and your face to form jowls and a permanent frown, and the lower part of your face to appear collapsed. Once the dental implants are in place, they stop and reverse the resorption process, allowing your face to appear normal and even years younger compared to having other tooth replacement options. Dental implants have a myriad of benefits, including the fact that they’re designed to feel, function, and look like your natural teeth. They’re reliable and long-lasting, and can be used to support ill-fitting partial or full dentures. Whether you use them with a crown or denture, implants provide a sustainable way to restore your healthy and confident smile—filling the gaps, restoring your facial structure, and giving you a youthful appearance. For more information call Roots on Whyte Dental at 888-396-4932 or contact us here.